The recent rally has largely been driven by the expectation of a more dovish federal reserve, despite the fact that the outlook in the US, while tempered, has always appeared more positive than the rest of the world, particularly Europe. This has led to a consensus that expects lower US interest rates to lead to a weaker US dollar from which it follows that emerging market equity and currencies are strong and global growth prospects are healthier. There is a danger to this consensus and it comes from Europe. The outlook in Europe has been deteriorating for some time, caused by a combination of the global trade wars, weakening the export outlook, and political disunity around government budgets. This combines with a still unresolved banking system, which can ill-afford increasing bad debts on the back of a slower, or even recessionary, economy which makes further monetary easing a near certainty in Europe, no doubt in the form of a further round of QE. Therefore, while the market’s attention has focussed on the Fed in the near term, perhaps the real story is likely to be elsewhere, with the ECB having to turn the taps back on at some point this year. A weaker outlook for Europe and the Euro looks likely from other directions also. The trade negotiations with China are, in part, focussed on improving the US’s relative attractiveness as a supplier to China’s growing markets. The obvious loser is Europe, particularly in the key industries of autos and capital goods, which are critical exports for Europe. Source: Bloomberg, 02/01/2018 to 13/02/2019. 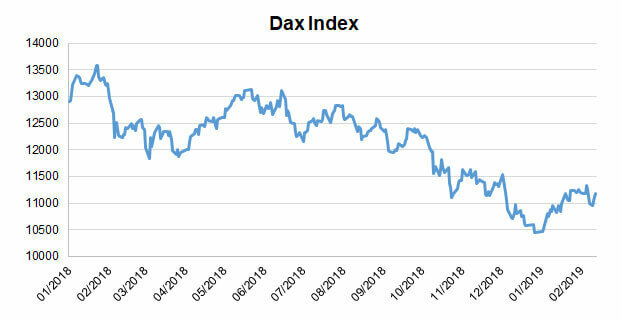 German Dax Index used as a proxy for the outlook for European exporters. In addition, this year sees European parliamentary elections, which are likely to see further gains for the populists and anit-EU parties in particular, emphasising the need for Europe’s political class to do more for its electorate. A final concern is, of course, Brexit which, in the case of a no deal outcome, while bad for the UK short term, is likely to see the substitution of European exports to the UK with cheaper goods from elsewhere putting a further spanner in the works for Europe. In the near term, this leads us to conclude that the real source of concern is not a slowing US economy, or the apparent slower growth in China but the ongoing and persistent troubles in Europe. At some point this year this is likely to come to a head, but ultimately leading to further QE in Europe, confounding the consensus for a weak dollar. Whether this is sufficient to undermine the current equity market rally remains unclear but it seems to us that exposure to the European economy, particularly the banks and major exporters is risky until policy changes. Our equity exposure focusses on the UK, US and emerging markets, with our European portion heavily reduced and largely focussed on areas not impacted by the European financial and economic environment. Source for information: Miton as at 13/02/2019 unless otherwise stated.